“Flo is very Japanese, from the elegant simplicity of the décor to the artistry of the bento boxes they put together for your lunch. This very traditional sushi restaurant and sake bar offers a large selection of sushi and sashimi that shows true respect for the simplicity sushi represents, with the freshest possible ingredients, authentic Japanese condiments, and a few nods to the Western palate they cater to. 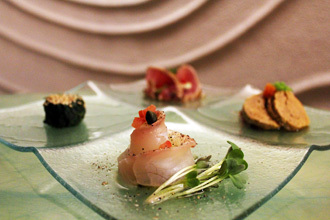 This fine balance between Japanese tradition and Western taste is uniquely Flo’s.